Continuing the theme of my previous post, I want to offer some thoughts on the paratextual experience in relation to contemporary television drama – in case you haven’t read my last post (see below) or you’re not familiar with the term, paratexts refer to secondary materials that are in some way related to the main text, i.e. posters, trailers, recaps, comic book tie-ins, interviews, podcasts, etc. In this post I want to consider the effect of paratexts and the extent to which they comprise our overall televisual experience. In other words, how much of watching television is actually watching television, and how much is consuming (and/or creating) paratexts? More importantly, how do these paratextual activities shape our understanding and experience of the main text itself? Although it is hard to qualify their effect, there’s no doubt that paratexts are an increasingly prominent part of contemporary television culture. The notion that paratexts shape our viewing experience has been explored elsewhere, but I’d like to take this idea one step further by suggesting that the paratextual experience differs significantly depending on when and where you are tuning-in. According to a recent Nielsen report, almost half of US smart phone and tablet owners use their devices whilst watching TV on a daily basis (note that this figure doesn’t account for laptop users). The actual use of these “second screens” is quite diverse and whilst this research reveals that it’s often simply a case of viewers checking their emails, a significant number of “second screen” users are engaging in broadcast-related activities. Primarily this includes discussing programmes in real-time on Twitter (creating a kind of nationwide “water-cooler effect”), checking in with social media apps such as GetGlue, or looking up details about shows through sites such as IMDb. Other research suggests that this pattern is global, with Ofcom reporting a similar trend in the UK. Of course, this on-air paratextual activity only constitutes a small part of the overall paratextual surround. Even before a programme airs there are countless promos and other publicity materials that saturate our screens – television spots, recaps, cast interviews, critics’ reviews, posters, the list goes on. There are also a myriad of amateur, fan-made, and non-official materials that circulate before or after a programme’s broadcast – blog posts, academic reviews, memes, again the list goes on. Whatever your level of involvement with these materials (as consumer or producer), it’s hard to deny that there is a growing culture of paratexts in the contemporary television industry. Once an area of critical neglect, academics seem to be more in agreement now that these materials play an important role in the way we engage with the main text – in short, they influence our expectations and shape our understanding of the programme at hand. Having established that these materials are not just important but are increasingly present within contemporary television culture, I’d like to explore how the experience of paratexts can differ drastically depending on when and where you are watching. It’s no secret that American programmes are highly successful in foreign markets; indeed they have come to depend on pre-selling formats in order to fund their spiralling budgets, as was the case for FlashForward (ABC, 2009-10) and The Event (NBC, 2010-11). But with the exception of the aforementioned, these programmes tend to arrive on foreign shores weeks, months, or sometimes years after their initial domestic broadcast. This creates an environment in which, more often than not, viewers in foreign territories (such as myself) will find themselves perpetually dodging spoilers – essentially forgoing the paratextual experience for fear of ruining any narrative surprise. For example, I’m currently avoiding any mention of Breaking Bad and Mad Men as I’m at least one season, if not more, behind the domestic US market. Although this isn’t necessarily a problem – it is possible to avoid significant spoilers if you’re careful – it does mean that you will end up experiencing the series quite differently to someone who was “there when it happened”. As I’ve suggested above, our understanding and experience of a television series is now so intricately bound-up with (and shaped by) the myriad of paratexts that accompanies it, that the experience of watching a series like Breaking Bad will be quite different for someone viewing it domestically (along with the various paratexts and popular online discussions) than someone viewing it weeks, months, or years later who will not have access to the same level of paratextual hype. This divide is exacerbated further still by the limited shelf-life of many paratextual materials, especially those found online. For example, if I were to watch the Breaking Bad finale several years from now (which is highly likely as I’m still only on the second season), the range of paratextual materials would be far more limited compared to the plethora currently available as the series nears its conclusion. Some of these materials will simply disappear – as is often the case with official network sites – whilst those paratexts that remain will no longer be part of popular discourse, and therefore harder to come by / stumble upon in your Twitter feed or on through your favourite websites. Then there are the highly time-sensitive paratexts such as Twitter conversations that create a “live” communal experience that cannot be replicated at a later date. Keen to improve viewing figures, networks regularly encourage viewers to Tweet-along to their programmes with designated hash tags. 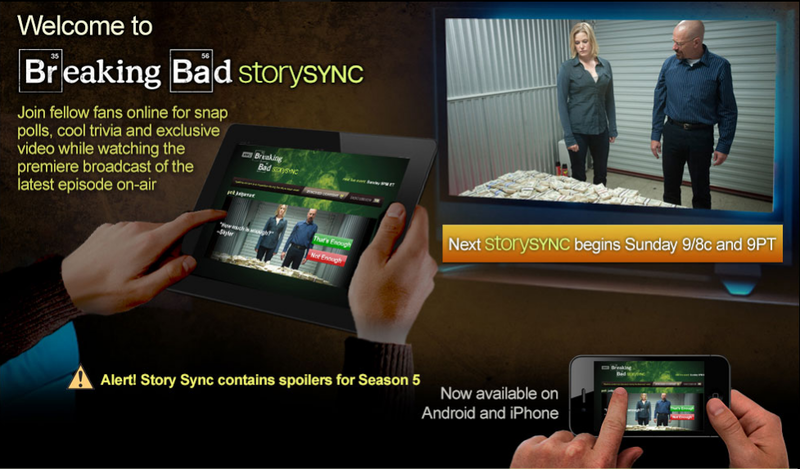 Meanwhile, some networks have sought to exploit the live potential of social media in other ways, with characters from shows Tweeting during the broadcast or in the case of Breaking Bad, creating “StorySync” – a smart phone / tablet app that features ‘snap polls, cool trivia and exclusive video while watching the premiere broadcast of the latest episode on-air’. Of course, this only works if you live in the US and have access to AMC. In the UK where Breaking Bad is broadcast on FX, and later on Channel 5, there is nowhere near the same level of paratextual effort. In short, viewers of a programme circulating in a foreign territory tend to experience a kind of “paratextual drought”, at least in contrast to domestic audiences. There’s an obvious logic behind all of this real-time paratextual activity; presumably it’s designed to bolster audience figures and combat online piracy by offering viewing pleasures that cannot be recreated at a later date. While that makes perfect sense, it ultimately creates a discrepancy in the viewing experience depending on when and where you are watching. For all I know, paratextual devices like “storysync” may just be a gimmick, but it would be nice to at least have the opportunity to try them first hand. Posted on September 9, 2013, in Breaking Bad, JP Kelly, Paratexts, Research, Royal Holloway, Spoilers and tagged AMC, Breaking Bad, JP Kelly, Paratext, Paratexts, Royal Holloway, Spoilers, Television, Twitter. Bookmark the permalink. Leave a comment.